With the start of the new year, lots of people, Brooklyn Creative League members included, are putting a new emphasis on exercise, health, and wellness. And what a great idea! Exercise doesn’t simply tone muscles and keep us looking good – it also helps you be more productive. Physical activities release stress, clear our minds, and can even boost creativity. Luckily for BCL members, we are located close to a plethora of facilities offering a variety of activities to help you reach your fitness goals and new levels of productivity! We compiled a short list of gyms, studios, and facilities within a short walking distance from BCL. Whatever you’re looking for, whether it be yoga, cross-fit, or a gym where you can pump iron in peace, you can find a spot for this activity in Gowanus or Park Slope. Affordable, clean, convenient, and spacious, this chain focuses on creating a positive mood for working out. With an array of modern machines and friendly staff, Blink is a great place for a good workout. BCL members get a special discount at this location. Speak to Devon for more info! Offering both 30 and 50 minute classes this studio focuses on High Intensity Interval Training, combining cardio, strength, core, and explosive training. Every HIIT session is unique, high energy, fun, and designed to make you sweat – making the workouts both effective and efficient. CFSBK is a very popular gym amongst BCL members! With the mission to provide safe, effective, and inclusive training for all members, it’s easy to see why. The staff aims to challenge and motivate all its attendees, striving to accept everyone for who they are and challenge them to be better. This vibrant studio offers more than 70 yoga classes per week, from beginners to advanced yogis. Bend + Bloom offers high quality yoga classes and workshops, and helps its students tune into their breathing, as well as energize and align their bodies. 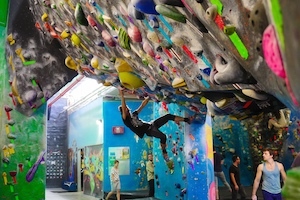 Brooklyn Boulders is an active lifestyle facility offering a variety of activities, including rock climbing, fitness, and arts + culture. From yoga to bootcamp, parkour to personal training, Brooklyn Boulders has something to offer everyone. Maybe this is the year you fall in love with rock climbing, or the year you learn to do a handstand, or the year you run that 10k you keep saying you’re going to run. With so many different facilities and activities surrounding BCL, we don’t have any excuses to not stay active! And if you are crazy enough to want to run outside in this cold weather, you can find Devon, our community manager, bundled up as she runs the Prospect Park loop. Anyone care to join her? You can find Devon on the 3rd floor and let her know!